Gastrointestinal stromal tumor (GIST), once classified among smooth muscle tumors, is the most common mesenchymal neoplasm of the gastrointestinal tract (GIT). The majority of these tumors occurs in the stomach. A small percentage of the cases may also present in tissues lying in close proximity with the GIT such as the mesentery and omentum, which is called extragastrointestinal stromal tumor (EGIST). They are defined by their expression of c-KIT (CD117), a tyrosine kinase growth factor receptor. GISTs are postulated to arise from primitive stem cells that phenotypically resemble the native c-KIT-positive gut pacemaker cells or interstitial cells of Cajal. These tumors have a spectrum ranging from benign to malignant lesions, depending on the anatomic site, tumor size, and mitotic activity. , The clinical manifestation of gastric GISTs is variable but the most common presentation is gastrointestinal (GI) bleeding from mucosal ulceration. Cystic change is not seen commonly in the initial stage but it may occur in a rapidly growing primary tumor with the central area of tumor necrosis. , We describe a high-grade EGIST with an unusual clinical presentation and radiologic features causing a diagnostic confusion. A 65-year-old man presented to the Surgery Outpatient Department complaining of progressive loss of appetite, a sense of fullness of the abdomen, and loss of weight of approximately 4 kg over the last 8 months. It was associated with occasional fever. He had chronic abdominal discomfort, which was more after taking food for the last 6 months, along with mild nausea and abdominal fullness. He denied symptoms of GI bleeding such as coffee ground vomitus and passage of black tarry stool or fresh blood with stool. Physical examination revealed normal body temperature and mild pallor; no lymph node was palpable. Jaundice and edema were absent. There was mild tenderness in the periumblical area and hypogastrium but no muscle guarding or rebound tenderness was noted. The liver and spleen were not palpable. The renal angles were nontender and the gonads were normal. His hemoglobin was 10.2 g/dL. There was leukocytosis and erythrocyte sedimentation rate (ESR) was 60 mm in the 1 st hour; the other routine biochemical parameters were within normal limits. Occult blood test in stool was performed twice with a 1-week time gap and it was negative on both the occasions. 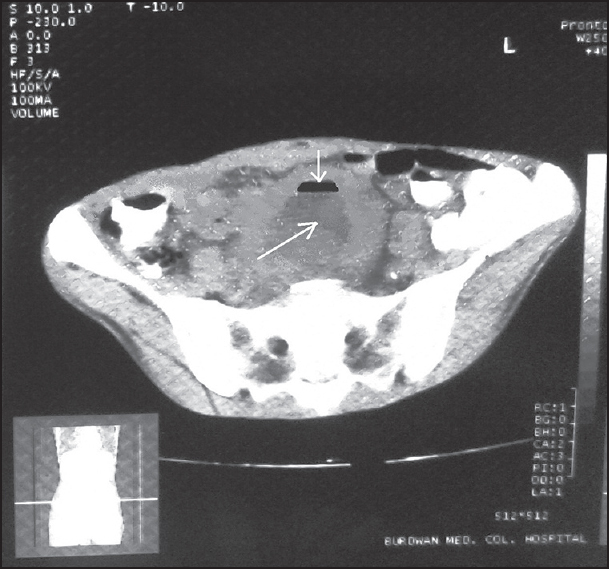 Ultrasonography (USG) of the whole abdomen revealed a well-defined space-occupying lesion (SOL) (11.1 cm × 8.1 cm) with the central area of fluid and air pockets situated in left iliac fossa and hypogastric region extending into the pelvis [Figure 1]. Contrast-enhanced computed tomography (CECT) of the abdomen revealed a large heterogeneous SOL in the pelvic cavity, the center of the lesion being hypodense with fluid density and there was evidence of air fluid level and peripheral enhancement, along with peripheral areas of fat stranding [Figure 2]. Ultrasonography (USG)-guided fine-needle aspiration cytology (FNAC) from the SOL showed cytological features of necrosis with plenty of neutrophils consistent with the pelvic abscess. Ziehl-Neelsen stain (ZN stain) was noncontributory. Culture of the fluid aspirated from the lesion did not show any growth of microorganisms. As the lesion was not resolving with conservative management, laparotomy was performed and a large mass of 13 cm × 10 cm × 7.5 cm was found to arise from the mesentery of the ileum approaching toward the hypogastrium and left iliac fossa. The patient underwent en bloc surgical resection. The mass was excised and sent to the Department of Pathology with the clinical impression of an infected mesenteric cyst. It was a well-circumscribed mass of the aforesaid measurement comprising a thick wall and a cystic cavity inside that contained a necrotic fluid. The cystic cavity of the mass was not in continuum with the ileal lumen. The tumor was yellowish white in color on the cut section. Microscopically, the wall of the cyst was composed of sheets of epithelioid and spindle cells arranged in an ill-defined fascicular pattern, with elongated pleomorphic vesicular nuclei, prominent nucleoli, eosinophilic cytoplasm, and indistinct borders and areas of necrosis. The mitotic count was >5/50 HPF. Immunohistochemical staining revealed that the tumor cells were strongly positive for c-KIT (CD117). Thus, the final diagnosis of high-grade EGIST was made [Figure 3]a-d. The postoperative period was uneventful. The patient is under follow-up for the last 1 year without any further complication. GISTs encompass a wide spectrum of tumors with varying locations and biological potential. Previously classified as leiomyomas, leiomyosarcomas, neurofibromas, and schwanomas, GISTs are now known to be quite different both histologically and immunohistochemically. They predominantly affect middle-aged and older patients (median age of 55-60 years). They can occur in any part of the GIT. The most common site is the stomach (60% of cases) followed by the small intestine (35%). But they also occur primarily in the mesentery, omentum, and even in retroperitoneum. They are called EGISTs. The GISTs are believed to originate from the intestinal cells of Cajal or related stem cells, and can be divided histologically into spindle cell (70%) and epithelioid variant (30%) subgroups. EGISTs usually present during adult life as enlarging masses of variable duration. Approximately 80% of EGISTs are located in the omentum or mesentery, and the remainder develops in the retroperitoneum. These lesions tend to be large when first detected with firm consistency and lack the whorled appearance in histology that is often seen with conventional smooth muscle tumor. It may undergo cystic change as a result of extensive hemorrhage or necrosis. They range from benign to malignant lesions. Malignancy criteria includes a large tumor size (diameter of >5 cm for gastric tumors and >4 cm for small intestine tumors), obvious mitosis count [>5/50 high-power fields (HPFs)], high density of cells, infiltration of the lamina propria mucosae, presence of coagulative tumor necrosis, high Ki-67-labeling index (>5%), recurrence, and metastasis. Metastases frequently occur in the peritoneum and liver, and rarely involve the bones, soft tissues, and skin; lymph node and lung metastases are extremely rare. GIST rarely presents with cystic changes as the main clinical manifestation, as seen in the present case though exophytic stromal tumors with cystic changes have been previously reported. The clinicopathological prognostic factors for GIST include tumor stage at presentation, tumor site, tumor size, and mitotic activity, cellularity, nuclear atypia, muscle Invasion, ulceration, Immunohistochemistry (IHC) markers, especially KIT-activating mutations, Ki-67 analogs, and telomerase activity. A large EGIST with mesenteric origin, tumor necrosis, features of malignancy, c-KIT positivity, high mitotic count, and high level of Ki-67 index carries a poor prognosis for our patient. In the present case, the tumor originated solely from the mesentery of the small intestine without having any connection to the intestinal wall. During operation, the location of the mass, site of origin, and its consistency resembled very much that of a mesenteric cyst. 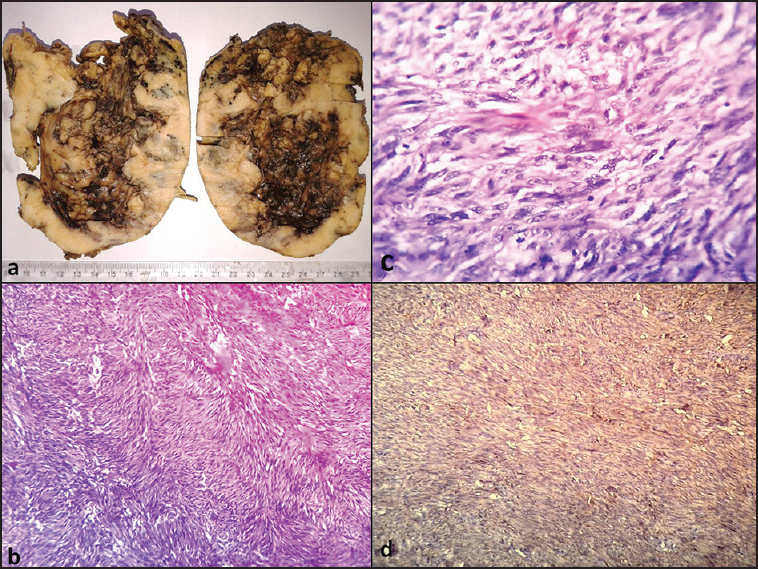 Thus, a large cystic mesenchymal tumor, which was later found to be malignant and high-grade in nature, created a significant amount of confusion from preoperative as well as intraoperative diagnostic aspect. 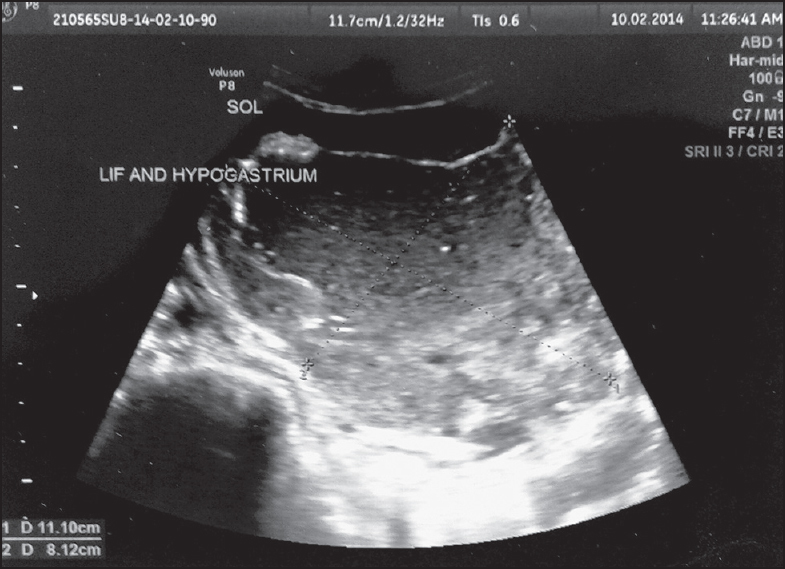 In conclusion, large high-grade EGIST of mesenteric origin with a central area of cystic degeneration and necrosis may present as a mesenteric cyst arising from the mesentery of the small intestine or as a chronic pelvic abscess. The radiological features may not be sufficient enough to distinguish it from the latter. It is an uncommon presentation of the tumor causing great difficulty from the diagnostic point of view before and during the operation. It suggests that large EGISTs with cystic degeneration should also be considered in differential diagnosis of chronic pelvic abscess and mesenteric cyst. The pathologist should be alert while handling the specimen during grossing. A proper diagnosis of high-grade EGIST with c-KIT mutation alters the primary and follow-up management of the patient. Miettinen M, Lasota J. Gastrointestinal stromal tumors - definition, clinical, histological, immunohistochemical, and molecular genetic features and differential diagnosis. Virchows Arch 2001; 438:1-12. Miettinen M, Monihan JM, Sarlomo-Rikala M, Kovatich AJ, Carr NJ, Emory TS, et al. Gastrointestinal stromaltumors/smooth muscle tumors (GISTs) primary in the omentum and mesentery: Clinicopathologic and immunohistochemical study of 26 cases. Am J Surg Pathol 1999; 23:1109-18. Burkill GJ, Badran M, Al-Muderis O, Meirion Thomas J, Judson IR, Fisher C, et al. Malignant gastrointestinal stromal tumor: Distribution, imaging features, and pattern of metastatic spread. Radiology 2003;226:527-32. Sripathi S, Rajagopal K, Srivastava RK, Ayachit A. CT features, mimics and atypical presentations of gastrointestinal stromal tumor (GIST). Indian J Radiol Imaging 2011;21:176-81. Ding G, Yang J, Cheng S, Kai L, Nan L, Zhang S, et al. A rare case of rapid growth of exophytic gastrointestinal stromal tumour of stomach. Dig Dis Sci 2005;50:820-3. Zhu C, Liu Y, Zhao G. Exophytic gastrointestinal stromal tumor with cystic changes: A case report. Oncol Lett 2014;7:1427-9. Miettinen M, Lasota J. Gastrointestinal stromal tumors: Review on morphology, molecular pathology, prognosis, and differential diagnosis. Arch Pathol Lab Med 2006;130:1466-78. Sandrasegaran K, Rajesh A, Rydberg J, Rushing DA, Akisik FM, Henley JD. Gastrointestinal stromal tumors: Clinical, radiologic, and pathologic features. AJR Am J Roentgenol 2005;18:803-11. Rudolph P, Gloeckner K, Parwaresch R, Harms D, Schmidt D. Immunophenotype, proliferation, DNA ploidy, and biological behavior of gastrointestinal stromal tumors: A multivariate clinicopathologic study. Hum Pathol 1998;29: 791-800. Miettinen M, El-Rifai W, H L Sobin L, Lasota J. Evaluation of malignancy and prognosis of gastrointestinal stromal tumors: A review. Hum Pathol 2002;33:478-83. Dennis KL, Damjanov I. Evaluating and reporting gastrointestinal stromal tumors after imatinib mesylate treatment. Open Pathol J 2009;3:53-7.